This summer, John Moran Auctioneers was excited to announce they had begun to consign property for their inaugural Women in Art Auction. The resulting catalogue featured works by 93 women artists, many California-based. Dating from the 19th century through to the contemporary, the works, media, and styles represented were diverse and appealed to a wide swath of collectors. At the sale’s start, the auction floor was very nearly full with attendee bidders, who had come out to preview and bid on the 124 lots. By the end of the auction, records had been set for three artists: Susan Hertel, Ethel V. Ashton and Dora Gamble. The top lot for the evening was a dark horse entry by French/Mexican poet and artist Alice Rahon (1904-1987). 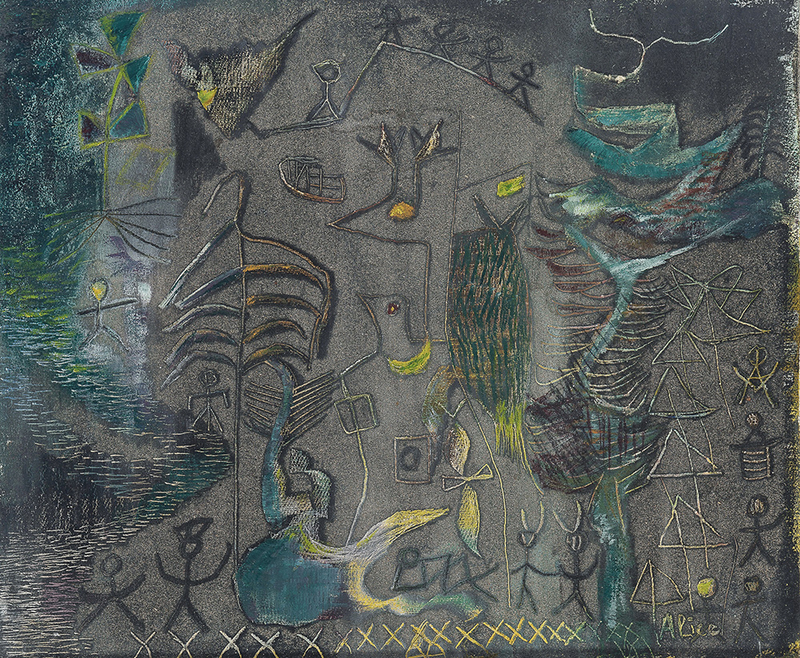 She became involved in Surrealism when she lived in Paris, and her 1945 composition “Boîte à Musique III” is an excellent example of her surrealist work. Offered for a conservative $6000 to $9000, the work brought $23,750 (all prices realized include Moran’s 25% Buyer’s Premium). Directly following the Rahon, a surrealist composition depicting an elephant-esque tightrope walker titled “I Looked into a Dream” by Illinois artist Julia Tecla (1896-1973) also inspired a healthy amount of bidding, selling for $7500 (estimate: $1000/2000). A texturally dense composition by California and New Mexico artist Susan Hertel (1930-1992), achieved an exceptional $21,250 selling price, a new record for the artist. The work hailed from the estate of well-known California watercolorist Millard Sheets, and is one of the best examples by the artist to have come up at auction. The cover lot for the auction catalogue, Kathryn Leighton’s (1875-1952) “The Young Chief” is a stunning example of the artist’s Native American portraiture. She began painting Native American portraits after her 1910 move to Los Angeles, and generally brought her subjects in to her studio to paint them. Arguably one of the strongest works by the artists ever to come up at auction and estimated to earn $18,000 to $22,000, “The Young Chief” did not disappoint, realizing $22,500 in all. A handful of selections by well-known Southern California plein air painter Nell Walker Warner (1891-1970 Carmel, CA) were featured in Moran’s Women in Art catalogue, including the artist’s large-scale view of freshly ploughed fields and a distant home in a mountain landscape. The sweeping canvas achieved a $5312 price realized (estimate: $3000 to $5000). A number of wonderful Modernist works were also included in Moran’s Women in Art catalogue, including Virginia Berresford’s (1902-1995 Martha’s Vineyard, MA) “Fort at Antibes”, dating to 1929 (price realized: $5625; estimate: $1000/2000). Mabel Alvarez’s citrus-hued still life with fruit, houseplants and a bottle of wine went to the block with a $3000/5000 estimate. Featuring heavy impasto, the work caught the eye of several collectors, ultimately bringing $5000 at the bock. Additional still life works by American painters include a charming watercolor “Fall Leaves and Acorns,” by Lanesboro, MA artist Ellen Bowditch Thayer Fisher. Dating to 1885, the work earned $2000 (estimate: $800/1200). Local Whittier artist Dora Gamble’s (1851-1933) oil painting of oranges and blossoms on the branch achieved $2812, well over the conservative $600 to $900 estimate, setting a new auction record for the artist’s work. Three jewel-toned, heavily shadowed figural compositions by New York-based artist Indiana Gyberson were offered at the Women in Art auction. The first of the three, depicting a Polynesian beauty framed against a seascape, proved most popular, selling for $2250 (estimate: $1000 to $1500). A trio of modern site-specific works were offered later in the sale, and excited collectors both with the quality of their execution and locales. Santa Barbara artist Hellen Rosseau’s (1896-1992) “View of Laguna Beach and Hotel,” dating to 1930, brought $5000, squarely within the $4000/6000 estimate. Los Angeles local Dorothy Sklar (1906-1996) was represented with a charming depiction of “Barry Alley, Chavez Ravine,” dating to 1949. Filled with figures of women and children on a sunny day in Los Angeles, the street scene brought $1750 (estimate: $1000/1500). Achieving an exceptional $8125, Ethel V. Ashton’s (1896-1974) view of sailors, women, and a family in a lush Philadelphia park was initially expected to bring between $2000 and $4000. The price paid for the park scene set the third auction record of the evening. Moran’s is presently consigning for their next Women in Art catalogue; contact Moran’s directly for more information on consignment, either via email: info@johnmoran.com or telephone: (626) 793-1833. In November, Moran’s will host Prints & Multiples and 20th Century Art + Design auctions on Tuesday, November 13th; full-color catalogues are available for both auctions. In November, Moran’s has scheduled five auctions across a two-day period: on December 11th, they will host their Rare & Important Timepieces from a Private Collector, Fine Jewelry, and Studio Auction – Jewelry sales; on December 12th, Moran’s will host Luxury Accessories followed by Art of the American West. All auctions take place at John Moran Auctioneers headquarters: 145 E. Walnut Ave., Monrovia, CA 91016.